(Nanowerk News) Scientists have used powerful X-rays from the Linac Coherent Light Source (LCLS) at the U.S. Department of Energy's (DOE) SLAC National Accelerator Laboratory, to study and measure, in atomic detail, a key process at work in extreme plasmas like those found in stars, the rims of black holes and other massive cosmic phenomena. The results explain why observations from orbiting X-ray telescopes do not match theoretical predictions, and pave the way for future X-ray astrophysics research using free-electron lasers such as LCLS. With its brilliant, ultrafast X-ray laser pulses, LCLS allows scientists to create and measure atomic processes in extreme plasmas in a fully controlled way for the first time. The study, initiated by the Max Planck Institute for Nuclear Physics in Heidelberg, Germany, and Lawrence Livermore National Laboratory, included scientists from NASA, SLAC and several universities. The 28-person team dissected a process in multi-million-degree space plasmas that produces some of the brightest cosmic X-ray signals. The results were published this week in Nature ("An unexpectedly low oscillator strength as the origin of the Fe xvii emission problem"). 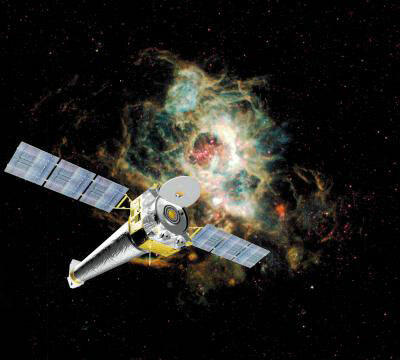 An illustration of the Chandra spacecraft, an orbiting X-ray telescope. Experiments at the LCLS X-ray laser could help researchers better understand their X-ray observations from space. "Measurements conducted at the LCLS will be important for interpreting X-ray emissions from a plethora of sources, including black holes, X-ray binaries, stellar coronae and supernova remnants, to name a few," said Gregory V. Brown, a physicist at Lawrence Livermore National Laboratory who participated in the research. Most astrophysical objects emit X-rays, produced by highly charged particles in superhot gases or other extreme environments. To model and analyze the extreme forces and conditions that generate those emissions, scientists use a combination of computer simulations and observations from space telescopes, such as NASA's Chandra X-ray Observatory and the European Space Agency's XMM-Newton. But in the case of an "Fe16-plus" iron ion ­– an iron nucleus with only 10 orbiting electrons, as opposed to the usual 26 – these indirect methods produced conflicting results. Fe16-plus is of particular interest because it produces some of the brightest cosmic X-ray signals. But satellite measurements show those signals are more than 30 percent dimmer than leading theories predict, Brown said. Many researchers thought this was because computer models failed to accurately depict collisions between the iron ions and electrons. So the scientists turned to direct measurements in the laboratory. At the LCLS, they created and trapped Fe16-plus ions using a device known as an electron beam ion trap, or EBIT. Then they used the X-ray laser to probe and measure the properties of the ions. To their surprise, they discovered that collisions with electrons were not a factor at all. "Our results show that the problem, or at least a large part of the problem, lies in our ability to model the structure of the ions," which is crucial for understanding the larger physical processes taking place in celestial sources, Brown said. 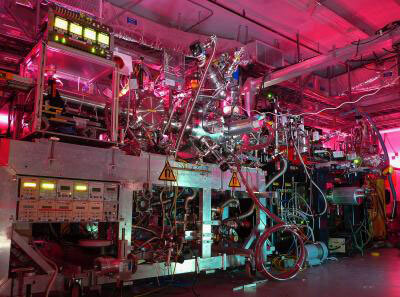 This is a photograph of the instrument setup for an astrophysics experiment at the SLAC's Linac Coherent Light Source (LCLS), a powerful X-ray laser. The experiment was conducted in the Soft X-ray hutch using this electron beam ion trap, or EBIT, built at the Max Planck Institute in Heidelberg, Germany. Some of the collaborating scientists have already begun working on new calculations to improve the atomic-scale astrophysical models, while others analyze data from follow-up experiments conducted at LCLS in April. If they succeed, LCLS may see an increase in experiments related to astrophysics. "Almost everything we know in astrophysics comes from spectroscopy," said team member Maurice Leutenegger of NASA's Goddard Space Flight Center who participated in the study. Spectroscopy is used to measure and study X-ray and other energy signatures, and the LCLS results are valuable in a "wide variety of astrophysical contexts," he said. The EBIT instrument used in the experiments was developed at the Max Planck Institute for Nuclear Physics and will be available to the entire community of scientists doing research at the LCLS. Sven Bernitt, a graduate student from Heidelberg, was in charge of the campaign, which was run by a collaboration led by José R. Crespo Lopez-Urrutia and Peter Beiersdorfer. Bernitt recalled the strenuous work in moving four tons of equipment from Germany to SLAC and preparing, commissioning, and conducting the experiments at LCLS: "We all had very little sleep for weeks in a row, but the scientific payoff was well worth it." The experiments were performed at the LCLS Soft X-ray (SXR) instrument, a facility supported by the DOE's Office of Science. Researchers from the Center for Free-Electron Laser Science, GSI Helmholtz Center for Heavy Ion Research, and Giessen, Bochum, Erlangen-Nuremberg and Heidelberg universities in Germany; Kavli Institute for Particle Astrophysics and Cosmology at SLAC; and TRIUMF in Canada also collaborated in the experiments.